Partnering with Julian Assange was unpleasant. But work like his is crucial. The Washington Post, Alan Rusbridger, Friday, 12 April 2019: “Of all of Julian Assange’s undoubted talents, maybe his greatest gift is the ability to make enemies. He trusts, likes and respects almost no one. He falls out with his friends and disgusts his opponents. Now that he has been dragged kicking and shouting from the Ecuadoran Embassy in London — where he was, by all accounts, the house guest from hell — he may find few allies in the world outside…. And yet. The laws protecting free speech should not depend on the likability, mental health or personal hygiene of those in the firing line. And Assange is now very much a target — being threatened with extradition to America to face charges relating to his collaboration with the source of the 2010 WikiLeaks revelations, Chelsea Manning. It may be that we have to suspend our complicated feelings about the man and consider the implications for free expression.” See also, The Indictment of Julian Assange Is a Threat to Journalism, The New Yorker, John Cassidy, Friday, 12 April 2019. Pete Buttigieg says he can beat Donald Trump in 2020, The Washington Post, Robert Costa, Sunday, 14 April 2019: “Pete Buttigieg, the 37-year-old mayor of this northern Indiana city [South Bend] who in just weeks has vaulted from being a near-unknown to a breakout star in the Democratic Party, officially started his presidential bid here on Sunday, presenting himself as a transformational figure who is well positioned to beat President Trump, despite being young and facing off against many seasoned rivals. ‘I recognize the audacity of doing this as a Midwestern, millennial mayor, but we live in a moment that compels us each to act,’ Buttigieg said in front of thousands of supporters, jacket-free with his sleeves rolled up. ‘It calls for a new generation of leadership.’ Buttigieg added, ‘It’s time to walk away from the politics of the past and toward something totally different. '” See also, Pete Buttigieg Announces Official Start to His 2020 Presidential Campaign, The New York Times, Trip Gabriel, Sunday, 14 April 2019: “Pete Buttigieg, the young Midwestern mayor whose presidential bid has been an unlikely early focus of attention from Democratic voters and donors, kicked off his campaign on Sunday and proclaimed his hometown’s revival [South Bend, Indiana] was the answer to skeptics who ask how he has the ‘audacity’ to see himself in the White House…. If elected, Mr. Buttigieg, a 37-year-old Rhodes scholar and veteran of the war in Afghanistan, would represent a series of historic firsts: the youngest president ever and the first who is openly gay. He said he was motivated to run despite his youth because of an urgency to correct the course of the Trump administration on climate change, health care and immigration. ‘This is one of those rare moments between whole eras in the life of our nation,’ Mr. Buttigieg said, adding, ‘The moment we live in compels us to act.’” See also, Pete Buttigieg’s Focus: Storytelling First. Policy Details Later. The New York Times, Alexander Burns, Sunday, 14 April 2019. See also, Pete Buttigieg’s Campaign Kickoff: Full Speech, Annotated, The New York Times, Alexander Burns, published on Monday, 15 April 2019. Justice Department says it expects to release a redacted version of the Mueller report on Thursday, The Washington Post, Devlin Barrett, Monday, 15 April 2019: “The Justice Department expects to release on Thursday a redacted version of special counsel Robert S. Mueller III’s report on President Trump, his associates and Russia’s interference in the 2016 election, setting the stage for further battles in Congress over the politically explosive inquiry.” See also, Justice Department says the Mueller Report Will Be Released on Thursday, The New York Times, Katie Benner, Monday, 15 April 2019: “Attorney General William P. Barr will release the highly anticipated special counsel’s report to Congress and to the public on Thursday morning, a Justice Department spokeswoman said Monday. Mr. Barr will release the report after department lawyers black out secret grand jury testimony, classified information, material related to continuing investigations and other delicate information, said the spokeswoman, Kerri Kupec.” See also, Mueller report to be released on Thursday, Politico, Darren Samuelsohn and Josh Gerstein, Monday, 15 April 2019. Ivanka Trump says she turned down her father’s offer to lead the World Bank, Politico, Caitlin Oprysko, Wednesday, 17 April 2019: “Ivanka Trump said Wednesday she’d turned down her father’s offer to lead the World Bank, and wouldn’t reveal whether he’d approached her about any other jobs in his administration. Trump, who serves in the White House as a senior adviser to President Donald Trump, was rumored earlier this year to be in the running for president of the global financial institution, though her father ultimately went with David Malpass, a U.S. Treasury Department official. In a profile of his daughter published last week, the president acknowledged for the first time that he’d thought about selecting her because ‘she’s very good with numbers. '” See also, Ivanka Trump says she passed on World Bank job, Associated Press, Catherine Lucey, Wednesday, 17 April 2019. Mueller Report Reveals Trump’s Efforts to Thwart Russian Inquiry in Highly anticipated Report, The New York Times, Mark Mazzetti, Thursday, 18 April 2019: “Robert S. Mueller III revealed the scope of a historic Russian campaign to sabotage the 2016 presidential election in a much-anticipated report made public on Thursday, and he detailed a frantic monthslong effort by President Trump to thwart a federal investigation that imperiled his presidency from the start. Mr. Mueller, the special counsel, laid out how his team of prosecutors wrestled with whether Mr. Trump’s actions added up to a criminal obstruction-of-justice offense. They ultimately chose not to charge Mr. Trump, citing numerous legal and factual constraints, but pointedly declined to exonerate him and suggested that it might be the role of Congress to settle the matter.” See also, Excerpts and Analysis From the Redacted Mueller Report, The New York Times, Thursday, 18 April 2019: “The Mueller report was just released by the Justice Department and Times reporters are reviewing it and posting excerpts. Read the full 448-page report handed out by the Justice Department.” See also, Redacted Mueller Report Release: What We Know So Far, Live Updates, The New York Times, Peter Baker, Thursday, 18 April 2019: “The redacted report by the special counsel, Robert S. Mueller III, has been released. He investigated Russian election interference, any ties to the Trump campaign and possible presidential obstruction of justice.” See also, Read the Redacted Mueller Report: Full Document, The New York Times, Thursday, 18 April 2019. See also, How Attorney General William Barr’s Excerpts Compare to the Mueller Report’s Findings, The New York Times, Charlie Savage, published on Friday, 19 April 2019. Charlie Savage tweet on Friday, 19 April 2018: “Barr’s use of fragmentary quotes from the Mueller report to bolster his narrative-shaping letter to Congress last month was misleading, omitting words & context to make them look better for Trump. Here is each passage in his letter alongside the original.” See also, A Portrait of the White House and Its Culture of Dishonesty, The New York Times, Peter Baker and Maggie Haberman, Thursday, 18 April 2019: “As President Trump met with advisers in the Oval Office in May 2017 to discuss replacements for the F.B.I. director he had just fired, Attorney General Jeff Sessions slipped out of the room to take a call. When he came back, he gave Mr. Trump bad news: Robert S. Mueller III had just been appointed as a special counsel to take over the investigation into Russia’s interference in the 2016 presidential election and any actions by the president to impede it. Mr. Trump slumped in his chair. ‘Oh, my God,’ he said. ‘This is terrible. This is the end of my presidency. I’m fucked.’… The White House that emerges from more than 400 pages of Mr. Mueller’s report is a hotbed of conflict infused by a culture of dishonesty — defined by a president who lies to the public and his own staff, then tries to get his aides to lie for him. Mr. Trump repeatedly threatened to fire lieutenants who did not carry out his wishes while they repeatedly threatened to resign rather than cross lines of propriety or law.” See also, The Episodes of Potential Obstruction of Justice by Trump in the Mueller Report, The New York Times, Michael S. Schmidt and Maggie Haberman, Thursday, 18 April 2019. See also, Mueller Rejects View That Presidents Can’t Obstruct Justice, The New York Times, Michael S. Schmidt and Charlie Savage, Thursday, 18 April 2019. See also, The Mueller Report Is 448 Pages Long. You Need to Know These 7 Key Things. The New York Times, Matt Apuzzo and Adam Goldman, Thursday, 18 April 2019. See also, Trump Ordered Aides to Search for Clinton Emails, While the Russians Were Already Looking, The New York Times, David E. Sanger, Thursday, 18 April 2019. See also, ‘Redacted’ Is the Word of the Day as the Mueller Report Lands, The New York Times, Sarah Mervosh, Thursday, 18 April 2019. See also, How Much of the Mueller Report Was Redacted? 22 Answers to Readers’ Questions, The New York Times, Thursday, 18 April 2019. See also, Mueller Report Leaves Unanswered Questions About Contacts Between Russsians and Trump Aides, The New York Times, Sharon LaFraniere, Thursday, 18 April 2019. See also, Read Attorney General William Barr’s News Conference Remarks Ahead of the Release of the Redacted Mueller Report, The New York Times, Thursday, 18 April 2019. See also, Attorney General William Barr’s Defense of Trump Rewards the President With the Attorney General He Wanted, The New York Times, Mark Landler and Katie Benner, Thursday, 18 April 2019: “For 21 minutes on Thursday morning, with the nation watching, President Trump had the loyal attorney general he had always longed for…. It was less a performance of the nation’s chief law enforcement officer than that of a defense lawyer for Mr. Trump, citing selective facts to build a case for exoneration and sidestepping elements of the report less favorable to the president. It enraged Democrats, drew heated and substantive rebuttals, and validated the fears of Mr. Barr’s critics that he would bring his expansive view of presidential privilege to a norm-shattering presidency.” See also, Trump Says He’s Having a ‘Good Day,’ but He Avoids Questions, The New York Times, Michael D. Shear and Annie Karni, Thursday, 18 April 2019. See also, Democrats Draw Closer to a Dicey Question: Whether to Impeach Trump, The New York Times, Nicholas Fandos, Thursday, 18 April 2019: “House Democrats, facing some of the most striking evidence yet from Robert S. Mueller III that President Trump attempted to thwart his investigation, edged closer on Thursday to confronting a question they have long tried to avoid: whether the president’s behavior warrants impeachment. Although the more than 400-page report made public on Thursday found ‘insufficient evidence’ to conclude that Mr. Trump conspired in Russia’s interference in the 2016 election and cited legal and factual constraints preventing Mr. Mueller from charging Mr. Trump with obstruction of justice, the special counsel presented months of damning presidential behavior that Democrats said left it up to Congress to review. ‘The conclusion that Congress may apply the obstruction laws to the president’s corrupt exercise of the powers of office accords with our constitutional system of checks and balances and the principle that no person is above the law,’ Mr. Mueller wrote in the report. House Democrats, in particular, took that legal analysis as a clear nod that Congress should take the next step to make its own judgment, although Republicans disagreed with that view.” See also, 2020 Democratic Presidential Candidates Target Attorney General William Barr Over the Mueller Report, The New York Times, Astead W. Herndon and Matt Stevens, Thursday, 18 April 2019. See also, Who Is William Barr? He Decides What the Public Can See in Mueller’s Report. The New York Times, Eileen Sullivan, Thursday, 18 April 2019. Live Updates: Mueller rejects argument that Trump is shielded from obstruction of justice laws, The Washington Post, Washington Post Staff, Thursday, 18 April 2019. See also, The redacted Mueller report, annotated, The Washington Post, Washington Post Staff, Thursday, 18 April 2019. See also, Mueller report lays out obstruction of justice evidence against Trump, The Washington Post, Devlin Barrett and Matt Zapotosky, Thursday, 18 April 2019: “The report from special counsel Robert S. Mueller III lays out in alarming detail abundant evidence against President Trump, finding 10 ‘episodes’ of potential obstruction of justice but ultimately concluding it was not Mueller’s role to determine whether the commander in chief broke the law.” See also, The 10 areas where Mueller investigated Trump for obstruction of justice, The Washington Post, Kevin Schaul, Kevin Uhrmacher, and Aaron Blake, Thursday, 18 April 2019. See also, Trump asked his lawyer, Donald McGahn, to cross legal lines. The Mueller report shows how McGahn pushed back. The Washington Post, Deanna Paul, Thursday, 18 April 2019. 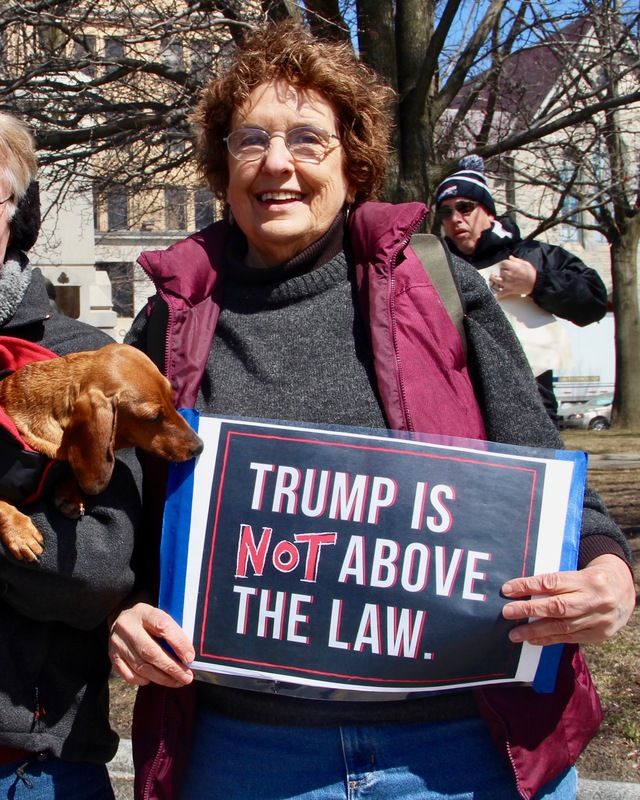 See also, Mueller’s report paints a damning portrait of Trump’s presidency, The Washington Post, Dan Balz, Thursday, 18 April 2019. See also, Here’s what Trump and his associates said at the time. Now, read what the Mueller report tells us. The Washington Post, Michael Brice-Saddler and Jacqueline Alemany, Thursday, 18 April 2019. See also, Mueller laid out ‘thorough and compelling’ case of obstruction, but Attorney General William Barr decided Trump wasn’t guilty of a crime, The Washington Post, Carol D. Leonnig, Devlin Barrett, and Josh Dawsey, Thursday, 18 April 2019. See also, What Attorney General Barr said vs. what the Mueller report said, The Washington Post, Salvador Rizzo, published on Friday, 19 April 2019. See also, Mueller report suggests the ‘fake news’ came from Trump, not the news media, The Washington Post, Paul Farhi, Thursday, 18 April 2019. See also, Paranoia, lies, and fear: Trump’s presidency laid bare by Mueller report, The Washington Post, Philip Rucker and Robert Costa, Thursday, 18 April 2019. See also, Mueller’s report paints a portrait of a campaign intrigued by Russian overtures, The Washington Post, Rosalind S. Helderman, Tom Hamburger, Karoun Demirjian, and Rachel Weiner, Thursday, 18 April 2019. See also, Trump campaign attempted to obtain Hillary Clinton’s private emails, The Washington Post, Shane Harris, Thursday, 18 April 2019. See also, Attorney General William Barr is under fire for news conference that was a boon for Trump and often featured one of Trump’s preferred terms, The Washington Post, Matt Zapotosky and Josh Dawsey, Thursday, 18 April 2019. Redacted Mueller Report Released–Live Updates and Analysis, The Wall Street Journal, Thursday, 18 April 2019. See also, Redacted Mueller Report Lays Out Trump’s Attempts to Curtail the Inquiry, The Wall Street Journal, Aruna Viswanatha and Sadie Gurman, Thursday, 18 April 2019. Mueller report whacks Trump with evidence of obstruction of justice, Josh Gerstein and Darren Samuelsohn, Politico, Thursday, 18 April 2019: “Special counsel Robert Mueller’s long-awaited report is more damning than President Donald Trump has publicly claimed, detailing Trump’s aggressive efforts to interfere in the Justice Department’s Russia probe and declining to rule out that Trump obstructed justice. Far from the ‘complete and total exoneration’ the president has declared in recent weeks, the report depicts a president who made repeated moves to thwart the investigation into his campaign and presidency, possibly because Trump was trying to hide other, potentially criminal behavior — although Mueller found no evidence of a criminal conspiracy to help Russia influence the 2016 election.” See also, White House press secretary Sarah Huckabee Sanders told Mueller team she misled the press about the firing of FBI Director James Comey, Politico, Katie Galioto, Thursday, 18 April 2019: “White House press secretary Sarah Huckabee Sanders told special counsel investigators that she misled the press about the reason President Donald Trump fired FBI Director James Comey in May 2017, when she told reporters that “countless” FBI agents had lost confidence in the agency’s leader. The revelation was just one of many brought to light Thursday when the Justice Department published a redacted version of special counsel Robert Mueller’s report detailing his investigation into Russian interference in the 2016 election.” See also, An annotated guide to the redacted Mueller report, Politico, Natasha Bertrand, Kyle Cheney, Andrew Desiderio, and Andrew Restuccia, Thursday, 18 April 2019. Annotating Special Counsel Robert Mueller’s Redacted Report, The Intercept, James Risen, Robert Mackey, and Trevor Aaronson, Thursday, 18 April 2019.